I never saw myself as a motorcycle rider, ever! Yet I often wanted a scooter and thought that it would be a lot of fun. I was a primary caregiver for my mother and I needed some kind of release and fun when I was not on duty with her, so in April of 2008 my husband and I bought ourselves scooters. 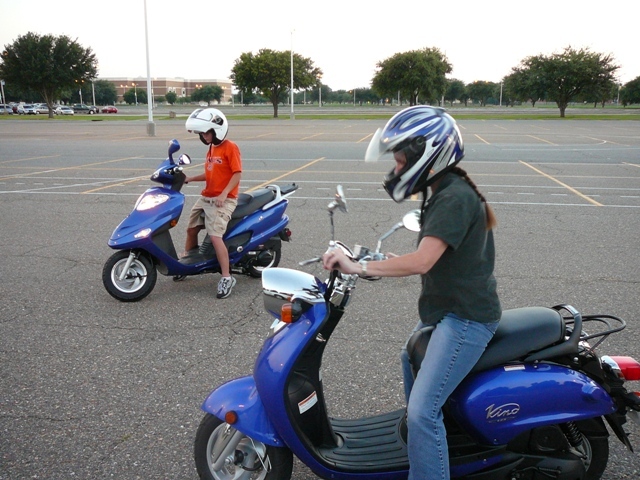 My daughter bought one too and we practiced at the LSUS parking lot until we felt comfortable on them. I absolutely loved it. I wore a helmet and I rode and I thoroughly enjoyed it. But my husband was heavier than I was and where I could make my scooter fly down Barksdale, easily doing 55mph in the area past Jimmy Davis bridge, his weight would not allow him to get up over 45mph. So three very short months later the decision was made to sell his scooter and move him up to a motorcycle. I wasn’t sure I wanted to do that. I knew I would look silly riding a scooter next to his motorcycle and I wouldn’t be able to keep up but I loved my scooter and wasn’t sure what I wanted to do. The deciding factor was when the Yamaha dealer called us and told us he had a husband/wife team that wanted both of our scooters and would pay us a good price if we would give up both of them. 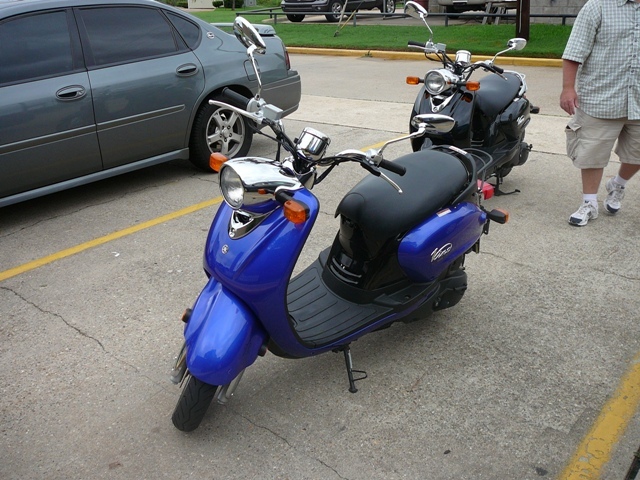 So I said sadly said goodbye to my beloved scooter and let him go to a new home. 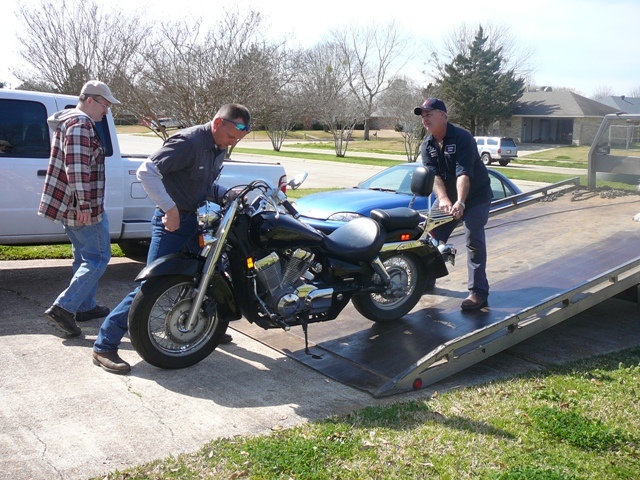 My husband bought a used black Honda Shadow 750cc motorcycle. I barely weighed 90lbs at the time and the weight of the bike was a huge consideration for me. I had to be able to pick it up off it’s kickstand at least. We hunted all over town for a small 250cc bike that would be appropriate for me. With gas nearing $4.00 a gallon at that point there were no small bikes to be found in the tri-state area. 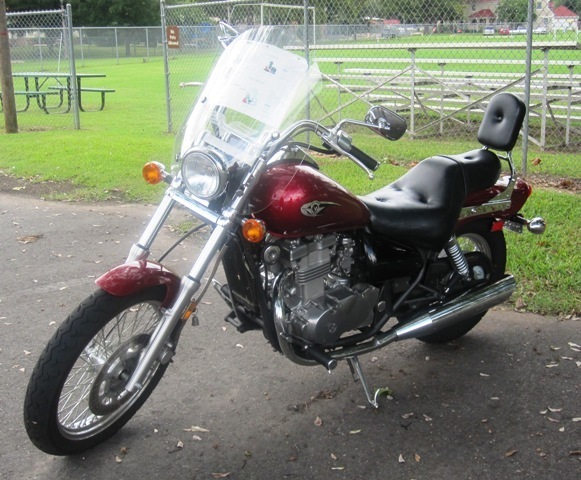 Eventually in August 08 we found a new Red Vulcan 500cc at a local dealer. I thought it was a little heavy but knew that it was the lowest cc I was going to find at the time so we purchased it. I enrolled in the Motorcycle Safety Course and quickly learned how silly I had been flying around on my little scooter with no protection other than a helmet! I learned the proper gear and bought myself gloves to protect my hands, boots to protect my ankles, and an armored and reflective vest to protect my upper body in case anything happened. The safety course provided 250cc bikes and I didn’t think I was going to pass because I had a wicked problem doing the figure 8 in the little square provided for it. I worked hard and the instructor stayed after class and worked with me and I manged to pass the course. But my confidence took a hit since I struggled with it so hard. After riding the 250cc I found the Vulcan to be even more top heavy and the center of balance was not right for me. Anytime I had to do the U-turn around the median to get out of our subdivision I was afraid I was going to drop the bike. If I barely turned the wheel the bike wanted to fall in that direction. I did drop the bike several (?) times. Although guys would always stop to help a girl pick up her bike I became unsure of myself and somewhat scared of the bike. 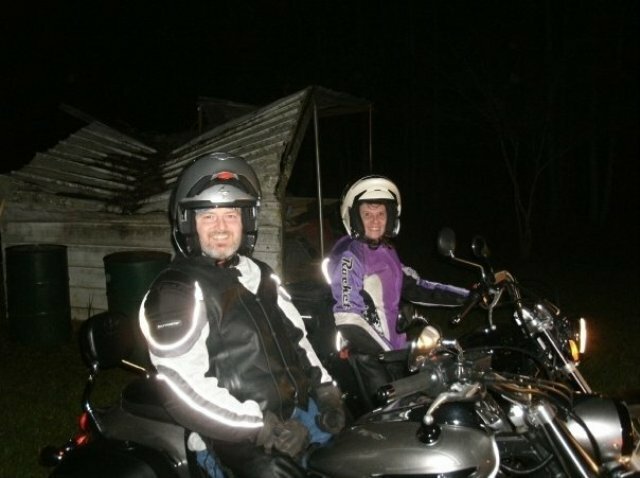 Although my husband loved it, to me riding was not really fun anymore. I missed my scooter. Then in February of 2009 my husband was coming home down the main boulevard of our neighborhood and a car pulled out from a stop sign right in front of him. With a car in the right lane turning right the car at the stop sign did not see my husband coming in the left lane. My husband t-boned the back quarter panel of the car and totalled out his bike. Thank goodness he was only doing 25mph at the time and he was wearing his protective gear! He fractured his left leg and broke three bones in his left hand. This was probably 50 yards from our driveway and I got the call that my husband was laying in the middle of the intersection by a neighbor. Surgery was done and a plate was put in his left hand. His leg healed on its own. Neither of us was sure at that point if we wanted to ride again. Other drivers just do not look out for motorcyclist the way they should. But once you’ve riden it infects your blood somehow and within a few months we were talking about riding again. There’s just a freedom in riding, even with all the protective gear, some motorcyclist think we are nuts for wearing. With the insurance money John bought a V-Star 950 Touring Bike and we got a call from a dealer that they finally had a 2006 Virago 250cc traded in if I wanted it. I put the Vulcan up on Craig’s List and I bought the Virago. I was happy with it for a few months. I really started enjoying riding again. I still had some leftover fears because of my experience with dropping the Vulcan. I still feared U-turns but it was certainly easier to handle than the Vulcan had been. But going down to half the cc’s that I’d had with the Vulcan was not easy. Especially since John had gone UP in the cc’s with his new one. He’d leave me behind at the red lights and I could forget riding on the interstate. There was just no get up and go. Although I loved riding, I became more and more unhappy with my bike. As much as I enjoyed riding this whole sport was just not working out the greatest for me. 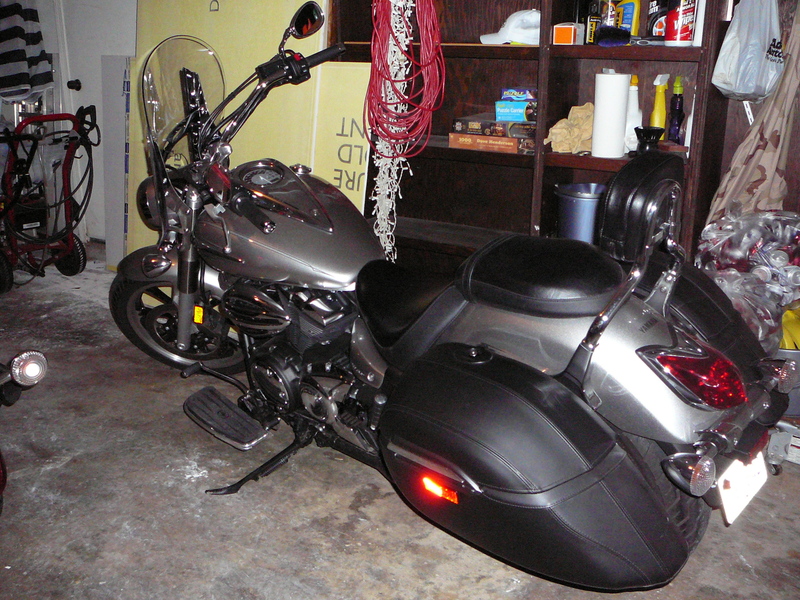 We browsed the bike shops and eventually in Dec 09 we came across a used V-Star 650. I was afraid to buy another new one. We’d taken a hit on the scooters and then quite a hit on the Vulcan since we’d been unable to sell it. The 650 had quite a bit of mileage on it but it had quite a few of the extras installed that are quite expensive to install yourself too. I had learned by now it wasn’t the cc’s that I needed to be aware of but the center of gravity. And of course the weight of the bike is still a consideration although I’m up to 110lb now. 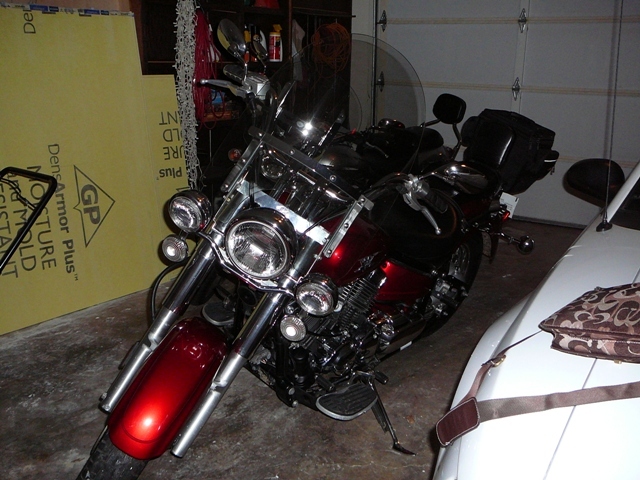 I traded in the Vulcan and the Virago both on the Star 650 and quickly came to love my new bike. Although it was bigger than anything I’d ridden before even John commented how much better I handled it than I had any of my previous bikes and how he felt more comfortable with me riding now. I gradually started getting over my fears and feeling more and more confident with my new sport. I really do love to ride and I feel pretty comfortable on my new bike! My skills are getting better anyway.